Last weekend we drove over to the southern tip of Point Reyes National Seashore, for a day trip to the tide pools at Duxbury Reef. Duxbury Reef is a huge shale reef (the largest in North America) that extends far into the ocean. The reef is comprised of Santa Cruz mudstone, marine sediments deposited millions of years ago. We’ve visited Point Reyes many times (it’s only an hour and a half from home), but Duxbury Reef was not familiar to us. However, after reading An Ocean Garden: The Secret Life of Seaweed, this book inspired us to go there. The tide pools at Duxbury Reef are like nothing we’ve seen in tide pools on the Pacific Coast. At first glance, the pools might not dazzle with emerald green sea anemones (Natural Bridges, Santa Cruz), clusters of bright orange and purple sea stars (Coquille Point, Bandon Oregon), red shore crabs (La Jolla Shores), but take your time to see this miraculous “between the tides” world at Duxbury Reef. On the rocks are animals you might not recognize – sea sponges. Sea sponges, which have been around for 500 million years, grow in colonies and blanket the rocks at Duxbury Reef. Our favorite is the pink Haliclona (in the video, bumpy pink rock with the black turban snails). 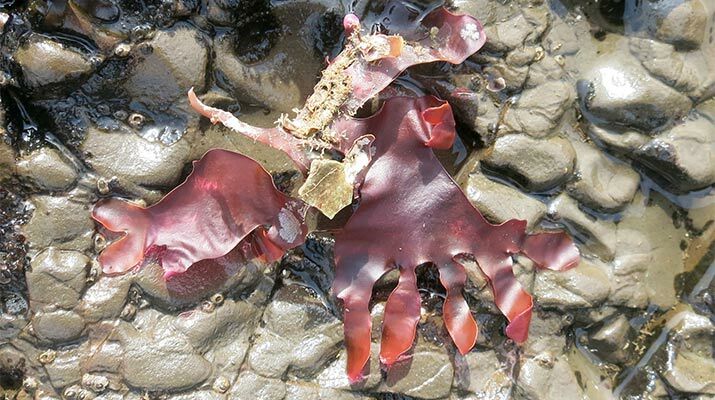 Chitons are another ancient sea creature kids will see at Duxbury Reef. Chitons have armor with eight shell plates (count them, the last plate may be covered under the mossy outer ring), and a big muscle foot, where they settle down on the rocks. But there are predators – birds, sea stars, sea otters; chitons, like armadillos can roll up in their shell armor to protect the inner body. And here’s two favorite illustrated field guides. 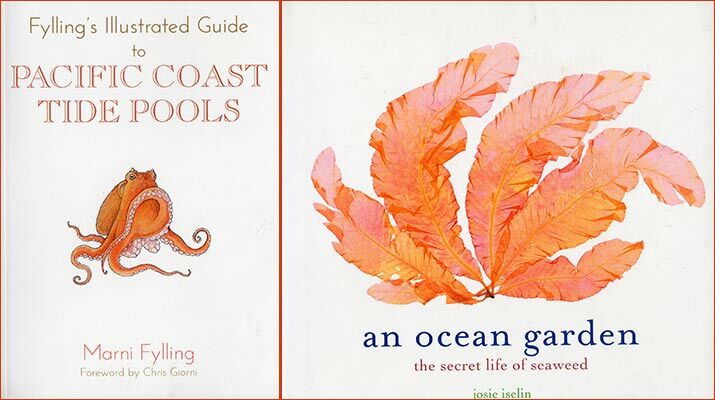 An Ocean Garden is perfect to read before you visit Duxbury Reef; bring Pacific Coast Tide Pools to identify tide pool life as you explore the reef. Pacific Coast Tide Pools by Marni Fylling. This is the perfect guide to Duxbury Reef – small and compact, filled with charming illustrations of tide pool wildlife. Now we know the difference between a giant green sea anemone and sunburst sea anemone, are not fooled by hermit crabs in black turban snail shells, and understand that the pink gummy looking stuff on the rocks is actually a live sponge. An Ocean Garden by Josie Iselin. The “ocean garden” is seaweed. And what an amazing garden it is! The author collects washed-up, and illuminates them on a scanner. Light shines on a secret world revealed by tides, and deep under the sea. It’s easy to get to Duxbury Reef tide pools, only a short walk from Agate Beach County Park parking lot. Check the tide tables and go when it’s low tide. Wear water shoes or shoes that can get wet. – Follow Highway 1 9.3 miles (14.9 km) south to the Olema-Bolinas Road. Note: There are no large signs for this intersection. If you end up with a large body of water or mudflats (Bolinas Lagoon) on your right, you missed the intersection. – Turn right onto the Olema-Bolinas Road, go 1.3 miles (2.1 km) south to the junction with Horseshoe Hill Road. – Go left and follow the Olema-Bolinas Road 0.5 miles (0.8 km) south to Mesa Road. – Turn right onto Mesa Rd., follow 0.7 miles (1.1 km) west to Overlook Drive. – Turn left on Overlook Drive, follow 0.5 miles (0.8 km) to Elm Road. – Turn right on Elm Rd., go 1 mile (1.6 km). The parking lot for Agate Beach County Park is ahead and to the left.